Urban business hotel with an emphasis on functionality and comfort! Hotel Ibis Seoul is the chain of the international hotel net work Ibis in Gangnam. It is the urban business hotel emphasizing on functionality and comfort with standardized room size and interior. 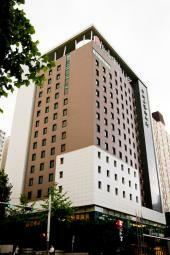 The hotel is located at Gangnam Samseongdong. High-rise buildings stand side by side and shops convenient for business people such as restaurants, convenience stores and coffee shops stand between those buildings. There is Hyundai Department Store nearby subway station and COEX, trade center and convention center are located across the street. The nearby Samseong station, subway line 2 is only 3 stops down from Jamsil station where Lotte World is located, and 3 stops up to the opposite direction there is Gangnam station, the center of Gangnam area. The hotel boasts 317 rooms at 3-15F with a selection of double room, twin room,Korean traditional ondol room and one room type suite room (with kitchen) for lonte-term travelers. The hotel offers a various facilities and servicce for business travelers such as meeting room, business center, sauna and fitness gym. Guests can enjoy breakfast/dinner buffet at the restaurant in 2F and have drink at bar with beautiful night view.